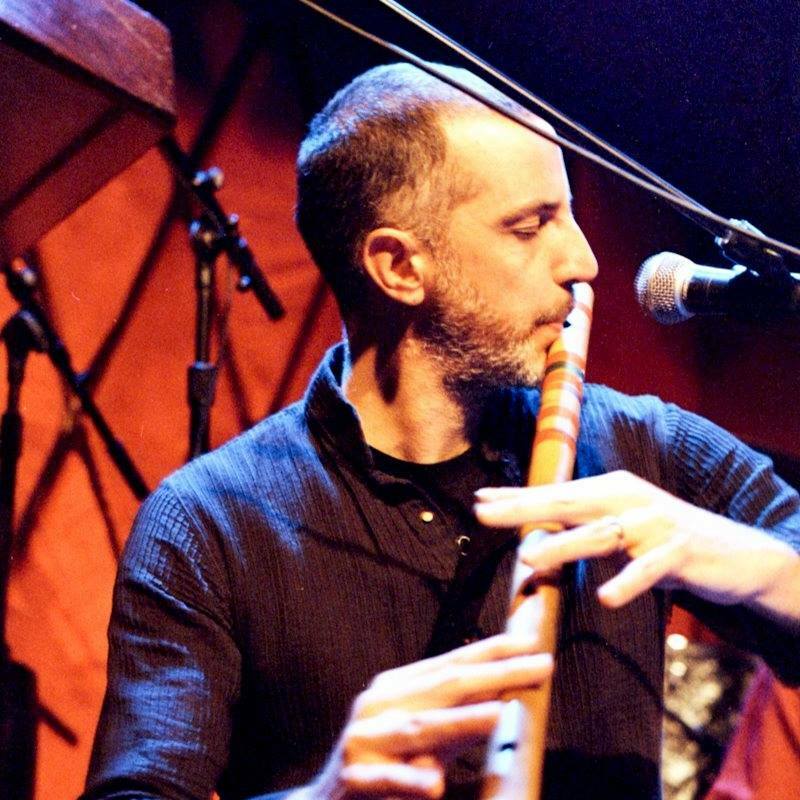 Having learned intensively and extensively in Kolkata, India, for over 15 years, Eric Fraser is a senior disciple of the legendary bansuri flute artist Pandit Gopal Roy, one of the only masters of the original "gayaki-ang" or vocal style of bansuri flute. 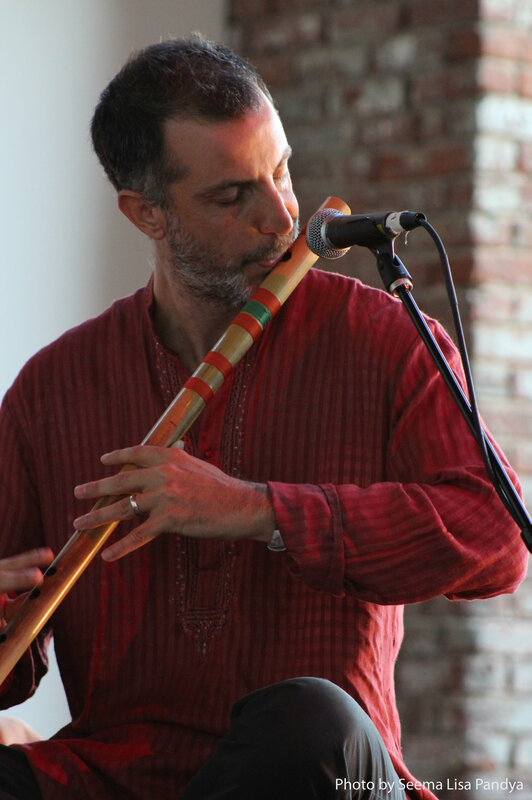 Eric's bansuri playing rings with authenticity and pure Indian tone, carrying a distinct and masterful sound imbibing a pure Gharana (Lineage). Eric Fraser is also a multi-instrumentalist, educator, composer, and Music Therapist (MA, MT-BC, LCAT). As a composer and songwriter, Eric's orientation to Indian classical music serves as an inspiration for melody, and a creative tool for improvisation in original styles of an American indie songwriting; incorporating singing, human beat boxing, guitar, keyboard, electronics and looping. Eric is currenlty a Professor of Music Therapy at SUNY, New Paltz, and 2010 Fulbright senior research scholar for Indian classical music. He is an experienced, licensed and credentialed Music Therapist (MA, MT-BC, LCAT) and group leader working with many populations ranging from Workplace Wellness offerings to Children and Adults with developmental disabilities. He is also a co-founder of the Brooklyn Raga Massive, and has toured, recorded, performed and collaborated with a great list of artists including Pandit Krishna Bhatt, Pandit Ramesh Mishra, Steve Gorn, Arturo O'farrell and Bollywood composer A.R Rahman at Carnegie Hall and many more, including radio performances (NPR morning edition and WKCR New York). Explore below to find works classical performances and ensembles/projects/bands. NEW VIDEO RELEASE!! Rag Chandra Kauns live at Hudson Hall, September 1st, 2017. Matt Tal (9 beats) and drut teental. Gharana, ( Hindi: “family” or “lineage”) in Hindustani music of India, a community of performers who share a distinctive musical style that traces to a particular instructor or region. The notion of a gharana arose in the 19th century, but it was not until the 20th century that the gharana took shape as a veritable system for the transmission of classical music. The system emerged as a means by which musicians could maintain their artistic authority—through emphasis of the lineage—in an era of declining court patronage. In the 21st century the gharana system remains a vital force in the validation of North Indian classical musicians. Padmabushan Pannalal Ghosh (1911-1960). The founder of Indian the bansuri flute in Indian classical music. Before his time the bansuri was used in folk music only. LISTEN TO GAYAKI FLUTE PARAMPARA ON YOUTUBE! 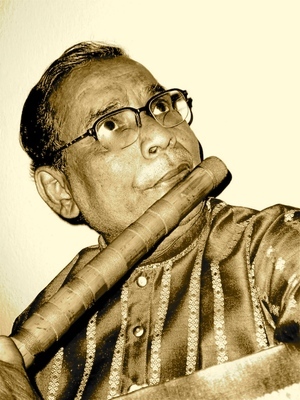 The Bengal flute lineage, or "Gayaki Flute Parampara", whose founder was the legendary Pannalal Ghosh, is purely from the Maihar Gharana in it's origins. This lineage has a distinctive sound that is rarely heard today, a style of flute playing that incorporates Indian classical Dhrupad (in alap, meend, gamak) as well as modern gayaki-ang and instrumental approaches. The rich confluence of traditional approaches in our lineage has evolved as a unique sound that holds the pure treatment of North-Indian Raga at it's core. The skills and techniques are meant to show the beauty of the raga, and not only as a display of virtuosity. This approach yields the "bhav" or nectar of the raga, imparting the mood of the raga and delivering it's effect on the mind and body. As Indian classical music is an oral tradition that can only be transmitted in person from gurus to disciples, it is important to mention the sources of taleem (oral teaching) that have converged in our gharana (lineage). 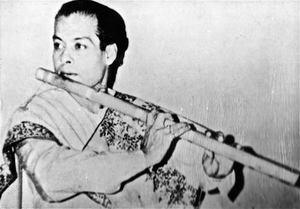 The legendary founder of the bansuri in classical Indian music, Pannalal Ghosh, was a disciple of Ustad Allaudin Khan, the founder of the Maihar Gharana. Pandit Gour Goswami was a disciple of Pannalal Ghosh, and he became the guru of my guru, Pandit Gopal Roy, and Steve Gorn. My guru, Pandit Gopal Roy, is also a disciple of the late Pt. Srikant Bakre, who was a leading disciple of the legendary Ustad Amir Khan. Sound Nidra Workshop - An integration of restorative yoga postures with a live healing sound bath. YOGA FOR LIVE MUSIC! As in traditional Yoga Nidra, a Sound Nidra session is designed to invoke yogic sleep or deep calming of the mind. In the Sound Nidra session, international performing musician and music therapist (MA, MT-BC) Eric Fraser teams up with his wife and master teacher/yogini Ruthie Fraser to bring live music and healing sounds to supported yoga postures that progressively open and unwind various territories of the physical body and subtle body. Participants will be guided into restorative yoga postures with straps, blocks and bolsters, which are accompanied by nourishing live music and sound for healing and meditation. The progression of both postures and sound offers a complete restorative experience on multiple levels. Instrumentation typically includes the Indian bansuri (bamboo) flute, voice, gongs, tuning forks, sitar, tabla, frame drum and other percussion instruments. Involves some simple vocal participation, no musical experience required. SKYPE and FACETIAE LESSONS AVAILABLE!